"You know, just for once I'd like a straight up fight. There's the enemy, shoot the enemy, go home." 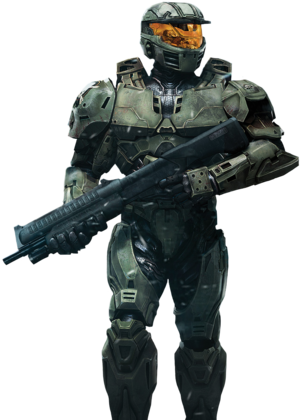 Senior Chief Petty Officer Alice-130, born Alice Treske, is a SPARTAN-II supersoldier of the UNSC Naval Special Warfare Command. She is a member of Red Team and fought alongside the crew of the UNSC Spirit of Fire in early 2531. Alice Treske was born in 2511 on the sparsely populated colony world of Passage. She was able to quickly learn rudimentary engineering at a young age — something that amazed her family and, along with her genetic make-up, set her apart as a suitable candidate for the SPARTAN-II program. In 2517, she was abducted and sent to Reach, where she was put through years of rigorous military training—a process she fully embraced and relished. In 2525, she and the other candidates underwent a series of augmentations to improve their strength, speed, and resiliency among other things. Alice was one of a number of "washouts" whose bodies initially rejected the augmentations, but she was able to be retrained and re-augmented separately. During the process, she was partnered with fellow augmentation washouts Douglas-042 and Jerome-092, with the three being organized into an incarnation of Red Team. In 2531, Alice accompanied Red Team in the Battle of Arcadia to aid the rescue of civilians on Arcadia. Red Team survived long enough to be supported by the arrival of the crew of the Spirit of Fire, who defeated the remnant of the Covenant forces at Pirth City. Afterward, she and Red Team assisted in a counter-attack on a Covenant outpost. 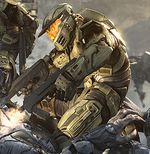 Once the plan to infiltrate a large Covenant shield was passed down from Captain James Cutter, she and Red Team remained with the crew to assist with the assignment. She prevented the destruction of several prototype Rhinos while they ensured the shield was destroyed. After Sergeant John Forge's forces triumphed over a Scarab, the three searched for Covenant survivors in the jungles on a Warthog. Upon hearing that Professor Ellen Anders had been abducted by the Arbiter, they went to the UNSC Spirit of Fire, where they followed the Covenant ship to a Shield World. Alice fighting at the Apex. Later, upon reaching the Etran Harborage, Alice assisted the Spirit of Fire crew in neutralizing Covenant and Flood forces. Once Alice assisted in destroying a proto-Gravemind, she and Red Team became stranded on the surface of the shield world. With the Spirit of Fire being dragged down inside the megastructure, Red Team was assisted by the forces of Sergeant John Forge and successfully withdrew to the ship. Red Team then aided the crew in scouring the Flood forces from the hull of the Spirit of Fire and successfully repaired the power core when it was damaged. Once Anders was rescued, Alice assisted Red Team in capturing a Covenant Scarab and used it to help Forge "lock down" the area. She was then tasked with ensuring the Spirit of Fire's Shaw-Fujikawa Translight Engine made it to the teleporter that would take it to the Apex Site. After arriving at the Apex, Red Team and Sergeant Forge encountered a force of Stealth Sangheili and the Arbiter. Forge dueled the Arbiter while Red Team engaged the other Sangheili. Red Team soon defeated the Covenant force and Forge killed the Arbiter with his own energy sword and Alice rolled the Arbiter's dead body off the platform after his death. Alice, with Red Team and the Spirit of Fire's crew, was then charged with opening the gate which allowed the Spirit of Fire to exit the Shield World. Once the Spirit escaped the destruction of the planet, the crew was put in cryo sleep. She, along with the entire crew of the Spirit of Fire, was listed MIA afterward, becoming one of the few Spartan-IIs to be truly missing. Alice and Jerome decide to retreat from Atriox. Douglas: "Ah, it feels good to have our feet back on real ground again, doesn't it, Alice?" Alice: "You saw this place on the drop down, Douglas. Nothing real about it." — The Spartans about the Ark. In 2559, after 28 years of drifting in space the UNSC Spirit of Fire found its way to the orbit of the Forerunner Installation 00, known as the Ark. Awakened from cryo-sleep, Alice, as part of Red Team, was tasked with investigating a UNSC distress signal coming from surface of the Ark. There, inside the abandoned UNSC outpost they encountered Isabel, a logistics AI, who warned the Spartans about a danger concealed on the Ark. The Spartans extracted Isabel and continued investigating the outpost. However, they were soon ambushed by the Jiralhanae warlord Atriox, the leader of a mercenary organization known as the Banished: Atriox defeated the Spartans, severely wounding Douglas-042 by crushing his left shoulder. Red Team was forced to retreat, and Atriox ordered his troops to hunt them down and capture them, in order to learn where they came from. It was not long before the team was in a Warthog and being pursued by Ghosts on their way for extraction. In order to escape their pursuers, Jerome requested an orbital bombardment on their location from the Spirit of Fire. Reaching the landing zone, Alice decided to stay back and provide cover for Jerome and Douglas' safe evacuation to the Spirit. Once they were clear Alice spotted a Ghost, commandeered it and made for the nearest portal, which transported her approximately two kilometers away from the main Banished forces. She stashed the Ghost in a nearby cave and observed a caravan detachment that had captured some of the UNSC troops from back at the outpost while maintaining comms silence. Alice mans an M46 Vulcan. Discovering an enemy compound, Alice infiltrated the base and freed the prisoners. After arriving at another research outpost, Alice sent an encrypted message to Captain Cutter, who informed her that Pelicans were on the way, but so were Banished forces. Managing to hold off the advancing Banished units long enough for the Pelicans to arrive, Alice and a few of the Marines managed to get aboard and escape. Shortly afterward, Cutter ordered Alice to take command of the rescued Marines and perform hit-and-run operations against the Banished, while Isabel prepared a briefing package to get her back up to speed with the situation. Soon her forces were attacked by Banished, and Alice was leading the defense of a UNSC base in that region of the Ark. She managed to hold the enemy long enough for them to send them into retreat. At some point during the operations on the Ark she killed Yam-Blim, an Unggoy thrall-taskmaster under the command of Decimus. Later on Alice was part of the Isabel's plan of dealing with Banished flagship, the Enduring Conviction. According to the plan, Douglas and his team would capture and utilize a Forerunner particle cannon against the Conviction, immobilizing it and disabling its shields, allowing Jerome and Isabel to infiltrate the carrier via its gravity lift, while Alice provided cover for Jerome. Reaching the Banished base below the carrier, Jerome noted that the grav-lift was guarded by the anti-air turrets and requested Alice's assistance in dealing with them. Alice positioned her Kodiaks on the edge of the cliff near the platform and ordered them to fire on the Banished ordnance. Once the particle cannon finally managed to break through the Enduring Conviction's shields, Jerome was notified that he was clear to board and all remaining UNSC personnel underneath the carrier were extracted immediately. As soon as the Enduring Conviction was destroyed and a new Halo ring emerged from the Ark's Foundry, Douglas and Alice were ordered to cut off the Banished reinforcements Atriox was sending to the Halo via the Ark's access points, which were blocked by vehicle barricades. To overcome the enemy blockade, Douglas commandeered a Banished Scarab, neutralizing its previous commander, Orda Val 'Saham, while Alice provided cover for other UNSC forces. After all enemy bases around access points were destroyed, Douglas and Alice were ordered to proceed through the portal and destroy it behind them, then move on to regroup with Jerome and assist with fighting the Banished forces on the ring in order to reach the control room. As the battle proceeded, a Retriever Sentinel suddenly appeared, wreaking havoc on the UNSC forces before the Marines could send it into retreat. After Red Team secured three control towers, Prof. Ellen Anders managed to take control of the massive sentinel and use its main weapon to gain access to the control room. As the professor descended to the control room, the Spartans and Marines stayed behind to defend the structure. With support from the Spirit of Fire, Red Team and Marines held back heavy Banished reinforcements long enough for Anders to disable the Halo's weapons systems and plant a distress beacon to the UNSC. After the Banished forces on the ring had been dealt with, Red Team evacuated to the Spirit of Fire immediately before the Halo entered slipspace and departed for the Soell system. Described as a natural Spartan, Alice lives for challenge and combat. While she can appear reckless, this impression is only brought on by a solid confidence in her abilities. She was in no way traumatized by the demanding training she and the other Spartan-IIs were subjected to, and only thrived on the challenge. She showed courage and determination, willing to put her life on the line to allow her teammates to escape. Alice preferred a straight fight. Alice wears olive green Mark IV MJOLNIR armor with a white stripe along the center of the helmet. Her right pauldron is painted with a Jolly Roger emblem; her biceps bear the image of a Sangheili skull with a bullet hole in the temple, set against a shield with crossed knives. She used an AIE-486H Heavy Machine Gun from the Battle of Arcadia to Spirit of Fire's escape from Shield World 0459. She and Douglas-042 both wielded pairs of M7 submachine guns during the raid on the Apex Site. During the Battle of Installation 00 in 2559 she used an M247H machine gun. Alice was portrayed by Leigh-Allyn Baker in Halo Wars and Nika Futterman and Erin Stewart in Halo Wars 2. Sergeant Forge and Red Team preparing to dismount Spirit of Fires slipspace drive in Halo Wars. Red Team about to attack at the Battle of the Apex. Red Team at the Apex. Alice carries wounded Douglas to Warthog while Jerome provides cover. Blitz card of Alice-130 in Halo Wars 2.